An immense and urgent need for cheap housing existed throughout Europe after WWII, yet building materials and skilled labour were in short supply. The French system Cauvet for heavy prefab was invented. The French engineer Raymond Camus patented a system for heavy prefab. In the early 1950s, heavy prefab flourished in France, as well as in other parts of Europe. La Magnanerie in Forest was built, partly with loadbearing cross walls and partly with the Barets system. Wonen/Habiter published an interview with J. Barets, the general director of the Compagnie Française d’Engineering Barets. Start of the construction of 140 low-rise houses in Woluwe-Saint-Lambert with the Barets system. In the mid-1960s, Camus had six factories in France and 16 factories in other countries, such as the U.K., Germany, Italy, Russia, and Algeria. A survey showed that only 2% of houses in Belgium were constructed with industrialized building systems such as heavy prefab. The term ‘heavy prefab’ or ‘heavy prefabrication system’ denotes industrialized building systems that involved large, prefabricated loadbearing floor and wall panels in reinforced concrete, which were mass-produced in a complete and closed concept. ‘Complete’ because these systems encompassed all elements and components necessary to create an entire building. ‘Closed’ means that the geometric configuration of the elements and the connection details were brand-specific (elements of one system were incompatible with those of other systems). Within each system, it was possible to erect a limited number of pre-defined buildings and building types, with a relatively small assortment of standardized components. In compensation for the limitations, these systems offered economic and logistical advantages. Economy was indeed one of the major advantages of heavy prefab. Additionally, industrialized buildings could be erected faster with a less specialized workforce, increasing the financial benefits even more. On the other hand, the design and construction process had to be adapted to the system: the characteristics of the system had to be taken into account during the architectural design. Inflexibility and the required minimum scale of a building project were two important drawbacks of heavy prefabrication systems. While heavy prefabrication systems were widely used in other West- and East-European countries in the post-war period, in Belgium the systems had more difficulty gaining a foothold. 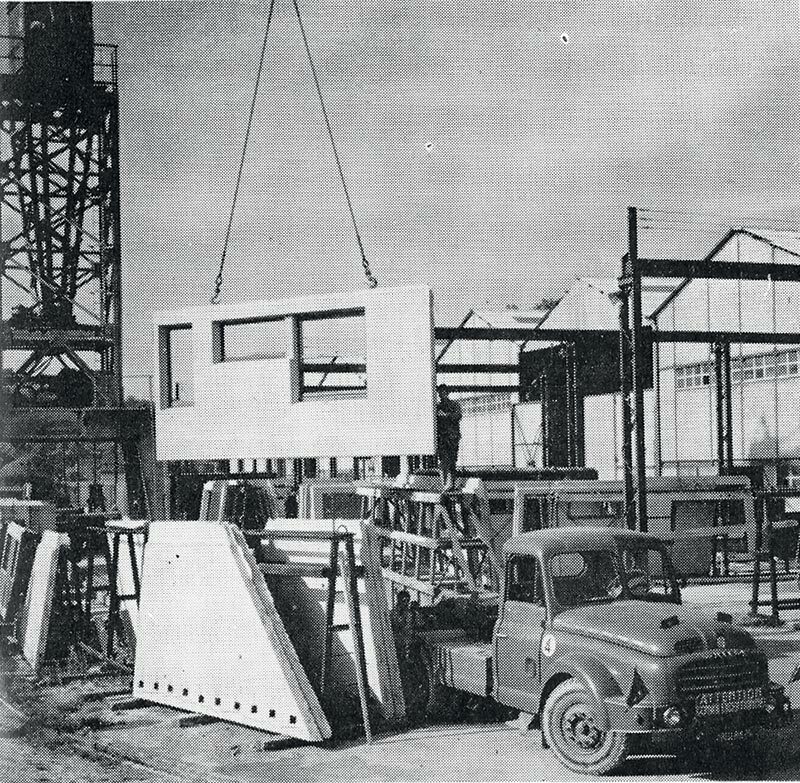 The emergence of heavy prefab was strongly linked to the immense and urgent need for cheap housing throughout Europe after the war, when building materials and skilled labour were in short supply. This created opportunities for alternative and experimental building methods that could speed up the construction pace and increase productivity. During the 1950s and 1960s, steady population growth, and ongoing scientific and technical developments in the building industry, prolonged this favourable atmosphere and enhanced the success of heavy prefab. In the 1970s, however, use of heavy prefabrication systems rapidly declined. In France, for example, where heavy prefab was very popular, many companies went out of business by the end of the 1970s. This resulted from a general decline in the building sector, higher standards for thermal insulation, and trends in architectural design. Especially in France, but in other parts of Europe as well, heavy prefab flourished in the early 1950s. One of the first and most successful French systems was developed by the French engineer Raymond Camus. This system, patented in 1948, was approved by the French Centre Scientifique et Technique du Bâtiment in 1949. Applied on a very large scale, it was one of the means by which the French government reached the very ambitious objective of constructing 20,000 dwellings a month. The Camus system became the symbol of the heavy prefabrication ‘à la française’ around the world. By the mid-1960s, Camus had six factories in France and 16 factories in other countries, such as the U.K., Germany, Italy, Russia, and Algeria. France was a pioneer in the development of heavy prefabrication systems. In addition to the Camus system, a large number of internationally successful heavy prefabrication systems were developed in France, e.g. Coignet, Barets, Cauvet, Estiot, Tracoba, Balency (Balency et Schuhl), and Porte des Lilas. In addition, dozens of systems of heavy prefab and industrialised building methods were developed in the U.K., Germany, the United States, Scandinavian, and Eastern European countries. Features that differentiate the systems include the composition of the materials; production and curing processes; the different successive layers within one element; the dimensions of the elements; and connections. Although each system had its particular features, there were nevertheless some general characteristics most heavy prefabrication systems shared. Typically, a system consisted of a fixed set of panels for façades, floors, and inner walls, as well as prefabricated staircases. The panels were up to 8 m long (or the width of one room) and were between 6 and 30 cm thick. The production process was highly mechanized. The panels were usually cast horizontally in steel moulds. Reinforcement bars and hooks or other features to facilitate transporting, handling, and joining the panels were provided beforehand, as well as frames for doors and window openings. Different kinds of concrete could be used, in some cases layered within the same panel depending on its function. A panel’s insulating capacity could be enhanced by adding an internal layer of insulation. Once cured and completed with surface finishes, the panels were transported to the construction site and placed in position. The metal hangers and protruding reinforcement bars were interlaced, and the joint was filled with concrete. During the 1950s and 1960s, the technical equipment and production circumstances of the prefabrication industry improved. One of the consequences of the professionalization was increased precision, which simplified the assembly. Another evolution, from the end of the 1950s onwards, was the trend towards more added value, by making panels of different layers as well as by integrating secondary features, e.g. window and door frames (first in wood and from the mid-1960s, also in steel), pipes, wiring, and finishing materials for inner and outer facades (plaster, floor coverings, etc.). 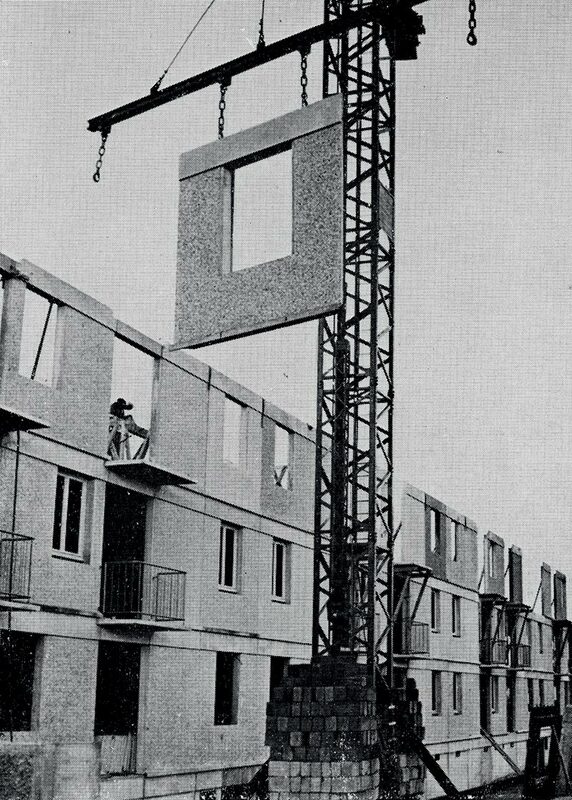 According to a survey in 1969, commissioned by the finance company Kredietbank, only 2% of houses in Belgium were being constructed using industrialized building systems such as heavy prefab. This percentage was significantly lower than in countries such as the U.K., France, and Germany, and in Eastern Europe, where their share was 10 to 30% of the total amount of houses. One of the reasons why industrialized building systems were less popular in Belgium was the limited number of large building companies: the Belgian building industry was dominated by small and medium-sized companies, many of which had four or fewer employees and were unequipped to put these techniques into practice. In addition, government policy was not very favourable towards heavy prefab. From 1948 onwards, the government indirectly stimulated traditional construction methods through the De Taeye law. This law promoted private ownership of individual houses by means of premiums and loans. The premiums were applicable to small, individual houses, which were usually built by small companies that used rather traditional construction methods. A De Taeye-house (of which 100,000 were built in merely five years’ time) was typically constructed with brick walls, timber window frames, and a saddleback roof covered with ceramic roofing tiles. The De Taeye law directed production away from large-scale, multi-storey, and collective housing projects, i.e. the main field of application in which heavy prefabrication systems were cost-competitive. The individualistic house building sector in post-war Belgium nevertheless profited from the technological developments of the building industry. While heavy prefab was not preferred, light or partial prefabrication was adopted, for example, with the so-called ‘improved traditional’ building materials such as hollow core slabs and lightweight concrete (discussed in chapters 1 and 4). These were more easily integrated into established building practice than were industrialized building systems and heavy prefabrication systems. Reflecting how little the system was used in Belgium, there are few references to heavy prefabrication in contemporary Belgian literature. The post-war architectural periodicals contain only a few articles about, and examples of, heavy prefabrication systems; in turn, their manufacturers did not advertise in those journals, given the limited market. In 1960 Wonen/Habiter, a journal issued by the semi-governmental National Institute for Housing (NIH), published an interview with J. Barets, the general director of the Compagnie Française d’Engineering Barets, one of the major French heavy prefabrication companies. However, this was more of a plea for the concept than a technical description. 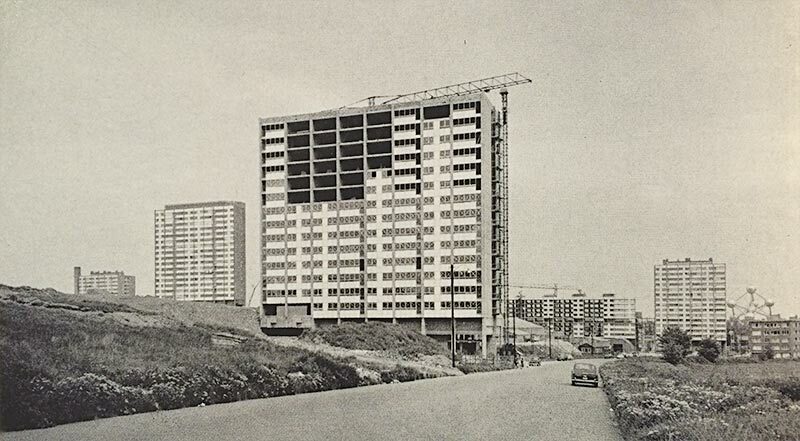 In 1964, the journal expounded upon the realization of the Ban Eik district in Wezembeek-Oppem, designed by the architects of Groupe Structures (1957-1960), in which two high-rise apartment buildings were constructed with the Barets system. In 1965, the journal Architecture gave one of the most extensive reviews in contemporary Belgian literature of heavy prefabrication. This special issue included a short technical description of 12 systems (Cauvet, Barets, Camus, Tracoba, Coignet, Bianchina, Estiot, Porte des Lilas, Fiorio, Costamagna, Pagnanini, and Technove) and a few case studies. One of the cases illustrating the status of the technology, is the Cité Modèle in Brussels, which was constructed with the systems Barets and Cauvet. These two French systems are in fact the only ones known to have been applied in Brussels in the post-war period. The reason that exactly these two systems were selected might be found in their flexibility (e.g. in dimensions and composition). In addition, the fact that they can be prefabricated on site, at the base of the buildings being erected, was important in Belgium, given the absence of major factories that manufactured heavy prefabrication elements. The Barets system consists of loadbearing façade elements, floor slabs, (non-)loadbearing cross walls, staircases, chimney units and in some cases also portal frames. The combination of portal frames and loadbearing walls was a-typical in heavy prefabrication systems. An attractive feature of the Barets system was its flexibility: designers could choose the material composition, finishes, and dimensions of elements, as well as the structural scheme of the projected buildings (with or without portal frames). The elements were cast at special, temporary casting sites close to the construction sites. After consulting the parent company, contractors (with a good reputation in large-scale building projects) could get a license to use the system. Additionally, an engineering design service was available. The contractor could use moulds supplied by the Barets company, but could also provide them himself. After elements were cast, set, and removed from moulds, they were put in place with a crane. To create a monolithic construction, the joints between adjacent elements were filled with in situ concrete. The protruding iron bars and loops of the floor, wall, and frame elements were laced together, with or without steel rods or pre-stressing wires threaded through them. Façade panels often were approximately 2.75 m high and 3.20 m wide, but the exact dimensions depended on the architectural plans and contractor’s moulds. The first step in their fabrication was to prepare the moulds, which included the insertion of window and door frames. The first layer that was inserted in the bottom of the moulds was a sheet of plasterboard, creating the inner side of the façade panels. On top of this plasterboard, a layer of expanded polystyrene of 2.5 cm was placed. The next layer, which fulfilled a load-bearing function, consisted of reinforced concrete and ceramic or lightweight concrete infill blocks. The final layer is a concrete exterior surface: it could be finished by special treatments working on the texture or colour of the concrete, according to the architect’s design. The U-value of external walls was between 2 and 4 W/m²K, depending on the depth of the insulation layer. The portal frames consisted of columns and beams in reinforced or pre-stressed concrete, and had one to four spans of 3 m each. The protruding reinforcement loops could be tied to iron bars protruding from other elements and finished with in situ concrete. The floor slabs came in various forms: plain, flat slabs in reinforced concrete; flat slabs with hollow cores (for services); and ribbed slabs (a thin slab with ribs at the edges and in the centre). The cross walls were made in reinforced concrete, sometimes combined with infill blocks to reduce the weight and improve the acoustic insulation. They could be left raw but smooth or finished with plaster. These cross walls were usually 2.75 cm high (the same height as the façade panels) and 10 cm thick. If necessary, a layer of expanded polystyrene could be incorporated, or services could be cast in the wall. The staircase units and chimney units were prefabricated in half-floor heights. Both were made in reinforced concrete, but the chimney units had an additional internal layer of lightweight concrete. Invented in 1946, the Cauvet system was used for high-rise buildings as well as low-rise houses. It was based on façade elements made of concrete with vertical cavities (30 to 70 cm wide), which were partially filled with concrete after they were put in place. These elements could be produced in a factory or on site with special cavity moulds. The system allowed for large variations in the dimensions of the elements and cavities, so that it could be adjusted to architectural plans. The Cauvet system was applied in Belgium by the contracting companies Structo and Strabed. The façade elements were cast in steel moulds in consecutive layers that consisted of typically 6 cm of concrete (outside), 2 cm of glass fibre insulation or expanded polystyrene, 2.5 cm of reinforced concrete, a cavity, and lastly 4 cm of concrete (inside). To create one monolithic element, steel rods were pierced through the insulation layer and connected the outside and inside concrete layers (6 rods every square meter). The interior walls were also hollow elements, prefabricated in the same way, and consisted of two layers of concrete and vertical cavities between. The hollow core floor slabs, again prefabricated in the same way, were supported by the wall panels. To allow the façade panels and floor slabs to interlock, the inside top of the façade panels was slightly lower than on the outside. Reinforcement bars protruding from the floor panels were bent upwards so to fit within the vertical cavities of the next façade elements: when the cavities were partially filled with concrete, to approximately 30 cm high, a cast in situ connection between the floors and walls was created. The vertical joints between two interior elements were filled with concrete, while the joints between the façade panels were filled with a plastic or bituminous material and mortar. The most popular heavy prefab system in Brussels was the Barets system. Thanks to the flexibility of the system, it was used not only in high-rise buildings but also in the more common low-rise housing projects. The National Institute for Housing (NIH) used it to construct a social housing project of 140 low-rise houses in Woluwe-Saint-Lambert. These houses were part of the district Les Pléiades (begun ca. 1961), designed by the architects of Groupe Alpha. The loadbearing façade panels, constructed on site, consisted of layers of plaster, insulation (reed panels), and reinforced concrete, with a washed finish and a plinth in black gravel. The Pleiades district also included high-rise buildings and traditional houses. Comparing the construction systems showed some of the benefits of the Barets prefabrication system, such as thinner walls, a lower material usage, no cracks due to the shrinkage of concrete, rapid construction, no external skeleton frame, and reduced heat loss. La Magnanerie and La Cité Modèle are probably the most famous examples of the Barets system in high-rise apartment buildings. Shaped like a boomerang and 16 storeys high, La Magnanerie in Forest (1955-1958) was designed by architect Claude Laurens, who was succeeded by architect Jacques Cuisinier. The technique used to construct the building changed halfway through the project: above the portal frames at ground level, half of the block was constructed with cross-walls (not of a particular system), while the other half was constructed with the Barets system. No details about this change in the construction are known. The Cité Modèle is the most extensive example of the Barets system in Brussels, although only the high-rise buildings of the first phase were built this way, while the others built with the Cauvet system. In its entirety, the Cité Modèle is a very extensive social housing complex, combining several housing typologies, from terraced single-family housing to high-rise towers. It was designed by an ad hoc collective of architects: Renaat Braem, Victor Coolens, Groupe l’Equerre, René Panis, Groupe Structures, and Jean Van Doosselaere. The architects did not contemplate using the Barets system. Rather, in the first tender round, some bidders proposed heavy prefabrication, as it had a (minor) positive impact on the budget; the architects accepted the idea and adjusted their drawings. Originally planned to be part of the 1958 World’s Fair in Brussels, the project was only finished in 1972. 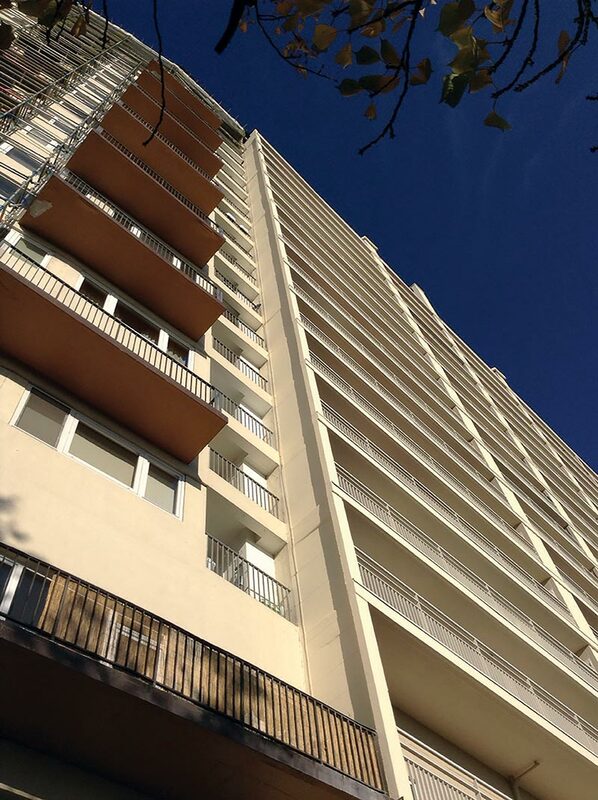 The first five high-rise blocks (I, II, III, V and VIII) were constructed by the construction company Entreprises Générales des Travaux d’Anderlecht (EGTA) using the Barets system. The floor and wall panels were all cast horizontally in concrete moulds. For the floors, which spanned approximately 5.60 m and were 15 cm thick, retractable metal tubes were inserted to create hollow floor slabs (seven cavities of 8 cm in diameter per meter). The wall panels were 14, 17, or 20 cm thick, depending on their location in the building, and one story high. All the pipes, fixtures, and door and window frames were put in the moulds before the concrete was poured. The stairs, too, were prefabricated: the flights of stairs were made as single elements, perfectly smooth and completely finished. Three days after the elements were cast, they were de-moulded and lifted into position by a crane. 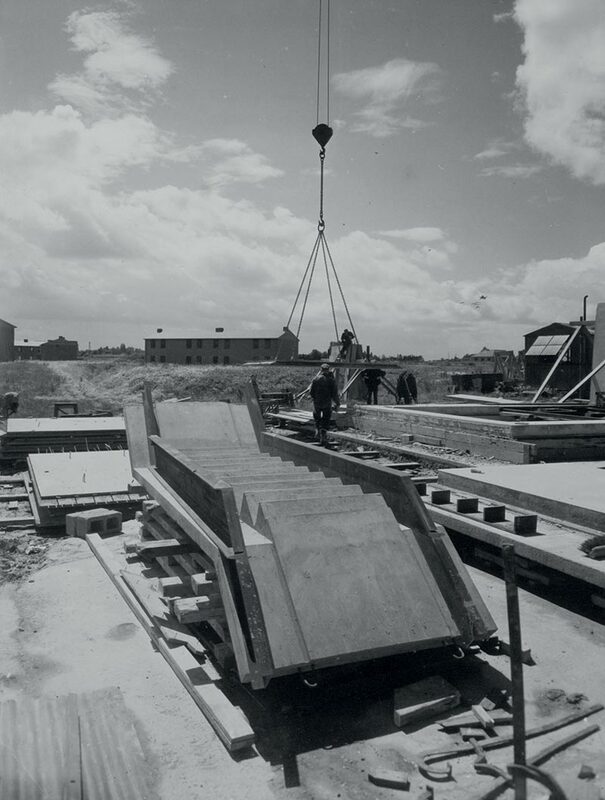 Once put in place and connected with in situ concrete, the panels formed a stable, reinforced concrete structure that supported both vertical loads and wind loads. Halfway through the project, a second round of tenders was organized and a new contractor (Strabed) was chosen, who used the Cauvet system to construct the apartment buildings IV, VI, and VII. In these buildings, the floor slabs spanned 5.50 m. They consisted of 5 cm of reinforced concrete at the bottom, an 11 cm layer with the rectangular cavities, and a 3 cm top layer of reinforced concrete. 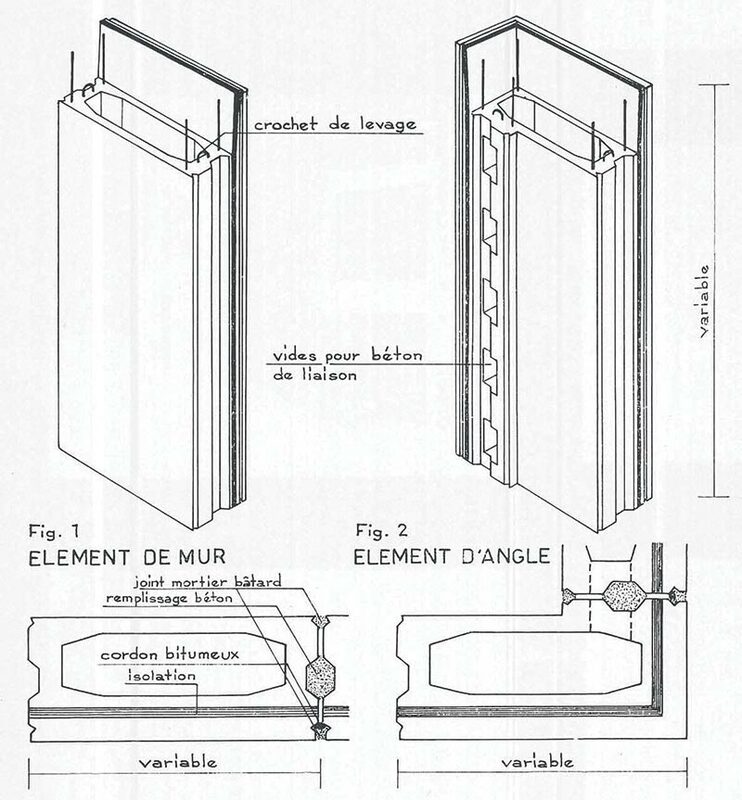 The wall panels had five layers: 4 to 6 cm of reinforced concrete (whether or not with a façade finish), 3 cm of glass wool insulation (compressed to 2 cm due to the weight of the concrete), an intermediate layer of reinforced concrete of 3 to 4 cm, a cavity layer, and a final layer of 3 to 4 cm of reinforced concrete, forming the inside surface. Except for the layer of insulation and details of the cavities, the Cauvet and Barets systems worked on the same principles.